Werner Herzog's well written and acted story of a man trapped in the American dream. Anchor Bay USA R0 boxset + DVD release. 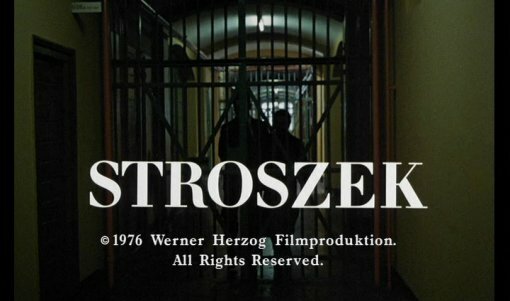 Bruno Stroszeck (Bruno S.) is released from prison and returns back to the streets of Berlin. Arriving back in his old haunts, he meets up with his old friend Eva (Eva Mattes), a prostitute who is being tortured by her pimps. He shelters her in his flat, but they return to beat her up and attack Bruno too. Eventually, along with their neighbour Scheitz (Clemens Scheitz) the trio head to America hoping to start a new life and live the 'American dream'. Moving to Railroad Flats, Wisconsin, they rent a mobile home and get work - but soon the money starts to dry up and the banks starts to put on the pressure - eventually Bruno grows to realise that the New World is no better than the old. Stroseck is on the surface a very simple story of 3 people trying to start a new life, but the script is clever enough to keep it interesting. In equal measures, the story is heartwarming and heartwrenching and keeps you guessing the whole way through, with lots of unexpected twists. Herzog had the advantage, when writing, of knowing who he was to cast in the lead roles and the film is written around these actors, even using their real first names; along with the naturalistic dialogue (in both English and German), this helps to give the film a lot of realism. Only towards the end does the film start to become more surreal as everything starts to go wrong, and the ending is simply off the wall. Herzog again avoids making any political statements here and the film never 'judges' America or blames it for the problems, some people claim the film to be a critique of American capitalism, but really it is a small scale drama with no judgement for their problems - which are equally bad in Berlin as in America. As with most of Herzog's productions, the pacing is slow and there is little action, so this is not one for the MTV crowd, but it is always moving and never drags. The film has a documentary ambience thanks to Herzog's use of handheld cameras and location shoots (there is no studio work here), the locations themselves are very well scouted and have a wonderfully Anytown USA feel to them, as though the story could be happening anywhere. There is some light music, used sparingly, that helps the atmosphere further. For the most part, Stroszeck uses non-actors. Bruno S. was a Berlin street musician and factory worker when cast in Herzog's earlier Enigma of Kasper Hauser (1974). After sucess of that film, Herzog decided to cast Bruno in an adaptation of the stage play Woyzeck, but he later decided that Klaus Kinski would be much better in the role (and he was, when the film was shot in 1979), so instead Herzog wrote Stroszeck for Bruno. His acting is very natural as the character was completely based on himself, he even tells true stories of his own past. Clemens Scheitz (the little old man) gets his only top billing here, an extra, also cast in Enigma of Kasper Hauser (1974), Herzog loved his eccentricities and again based the character on the man himself. Eva Mattes is the only real actor in the film and she works very well, especially helping to get a good performance from Bruno in their scenes together. Most of the rest of the cast are 'real people' found during shooting, and they all play their appropriate parts well, helping the film's documentary style. Almost neo-realist until the equally tragic/comic and surreal climax, Stroszeck is a very cleverly written film with top performances from the cast and some good direction. A great film and highly recommended to all, especially Herzog fans. Any violence/gore? Some blood and a few fight scenes, nothing special. Highly recommended to all cinema fans and a must see film for Herzog fans. Good soundtrack? A light mix of American contemporary themes. Subtitles English translations of the German audio, the English language scenes are unsubtitled. Other regions? Anchor Bay UK DVD includes same features plus remixed 5.1/DTS German audio (although this is apparently very flat, since the audio is mostly dialogue). A well written story with good, documentary style direction and some great acting. Highly recommended. A decent looking print/audio and an interesting audio commentary. All text in this review written by Timothy Young - 27th August 2006.